Info "Smash the stairs to keep Eggplant Man from attacking!" Wrecking Crew is one of 9-Volt's microgames in WarioWare: Twisted! It is set in the NES game of the same name. The objective is to have Mario get all the Eggplant Men away from him by hitting bombs with his hammer, thereby destroying the ladders. 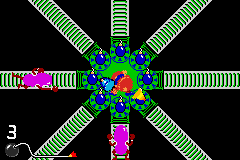 The view begins at the side (like the original game), but quickly changes to a top-down one. If Mario gets hit by an Eggplant Man, he will fall off-screen and the player will lose the microgame. 1st level difficulty: Hit one Eggplant Man away. 2nd level difficulty: Hit two Eggplant Men away. 3rd level difficulty: Hit four Eggplant Men away, but some of them will not attack. Very rarely, it is possible to win by standing still. This page was last edited on November 13, 2018, at 22:38.